Degrowth points to the need for a radical transformation of the economic system if humanity is to avoid a wide-ranging ecological collapse. Any realistic strategy of addressing the ongoing anthropogenic planetary ecocide will need to tackle the issue of ‘economic’ growth – how do we stop it while ensuring well-being and flourishing? How does anarchism fit into the degrowth narrative? Why is it important to be explicit about the anarchist roots of degrowth? And how can anarchism benefit from engaging with degrowth ideas? Join us in discussing these questions. People on the move in Velika Kladuša - a migrant or moral crisis? The status of people on the move in Velika Kladuša, with an overview of the situation in Bosnia and Herzegovina; the treatment of people on the move in transit through the territory of Croatia and Slovenia. A discussion on the responsibility of both individuals and the whole society for these issues, and on ways of becoming involved and providing support. During May 2013 a large number of "anti-terrorist" operations against the anarchists in Spain began. These operations resulted in more than 100 arrests and 50 charges with terrorism. The operations finished in February 2016. The final result were 4-year jail sentences for two persons. In April 2016 another two comrades were arrested and accused of bank robbery. One of them was convicted to 7.5 years of prison. All of this provoked great solidarity in the Spanish anarchist movement, but operation after operation caused the death of this solidarity. Tired, afraid, alone, the anarchists in Spain could not react and fell in a state of pessimism and negative perception. Now, there seems to be no anarchist movement in Spain, only a more or less big group of isolated people that focus on other views and fighting (feminism, veganism,… and others) more theoretical and symbolic than real. How solidarity was built, how it fell, what were the strong points and what were the weaknesses will be discussed in this presentation. Presenting the second issue of the magazine Antipolitika, printed in Serbo-Croatian and English, which in its second issue focuses on 'socialist' Yugoslavia.The new issue of Antipolitika is a collaborative effort of about 20 comrades from the Balkans, Europe and America. It contains new texts written specifically for this issue, as well as older texts, some of which were previously not available in the Serbo-Croatian language. These texts approach ,,socialist“ Yugoslavia from an angle that is usually not espoused by the mainstream left and right – they approach former Yugoslavia as a distinct period of capitalist development in the Balkans and as a statist project which brings with it all the power relations, tensions, expectations, and conformisms that accompany every hierarchical and authoritarian organization of the human sphere. The discussion will focus on a successful direct action undertaken in the village of Trkulje (Blatusa, Vrginmost municipality) which managed to temporarily stop the excessive deforestation and further destruction of the communal infrastructure indispensable to the local community. A critical overview of the experiences of squatting and creation of radical, self-organized groups, which points out the necessity of avoiding the legalization of occupied spaces, our groups and resistance in general. Advertisements are type of pollution of public spaces which actually belongs to everyone. We often see how they promote products for ˝ideal˝ body or unhealthy food and psychologically affecting our lifestyle. We want to get rid of them and at the same time focus people on the real problems which won't be found in media. Come if you want to find out how. Organisation AKC (eng. Autonomous Cultural Center) Attack, established in 1997, supports independent cultural scene by organising art festivals, alternative gigs, movie and theatre productions, art exhibitions, and free educational content. It also houses a library.This presentation will cover the five-year period (2004-2009) during which AKC Attack functioned without a permanent space for organising projects, and the activities undertaken during that period with the goal of acquiring its own permanent space. These activities ranged from public pressure campaigns in cooperation with other participants of the independent cultural scene in Zagreb to the illegal and temporary occupation of available city spaces. It will also cover the occupation of the former factory space previously operated by Medika and the processes which led to the legalisation of this space. It will give an overview of today's management of the AKC Medika, which is home to a dozen organisations and informal collectives, and sixty independent artists. The panel gathers several collectives from Croatia, as well as one collective from the Czech Republic, which will briefly present their own communities – the history of the communities, their respective relations with both the municipal governments and local communities, their projects and the problems they've encountered in their work.Following the presentation of their communities, we will hold a moderated discussion which will dwell on distinct problems and challenges which the communities have encountered during their work in Croatia and the Czech Republic. Bookfair - come and have coffee or tea, look for the book you missed the previous days, and spend your sunday morning in a pleasant company... . That would be the closure of the 15th Zagreb anarchist bookfair. The talk will present recent situation with squatting movement in the Netherlands and more particularly show the example of a community living in a squatted building called Poortgebouw in Rotterdam, which was squatted in the early 80s by a group of activists and artists as a protest against the plans for an Eros centre in the building. Today Poortgebouw is home to 30 people, a bar, a theatre, a wood workshop, a photography darkroom (DoKa) and a guest room. It is also a space for affordable living in a co-operative group and a place for cultural and political actions platforms. The international community of people that live there has to cope with the pressure of gentrification that is pushing them out, struggles with owners and their own internal struggles and conflicts. 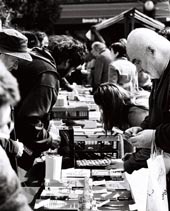 That would be the closure of the 15th Zagreb anarchist bookfair.